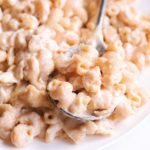 Instant Pot 3-Cheese Mac and Cheese - What's In The Pan? 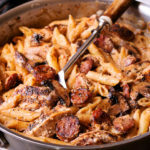 Instant Pot 3-Cheese Mac and Cheese is an easy one-pot meal that comes together in under 20 minutes, creating the perfect comfort pasta recipe. 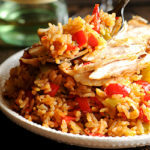 It’s a family favorite recipe, loved by both children and adults. Quick and delicious weeknight dinner that you can have on a table in no time. There is just something so comforting about a pot of the best macaroni and cheese. Especially when that pot includes three kinds of melted cheese! My ultimate comfort food is a divine blend of cheddar, Mozzarella and Parmesan cheeses. Every time I make it, which is often, everyone in my family has multiple servings and happily eats any leftovers the next day. Whenever the kids love a recipe, I consider it a winner. I love making homemade macaroni and cheese in the pressure cooker, especially when I need fast and easy dinner! 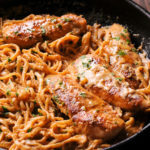 You get a rich creamy sauce covering tender noodles and it’s finished with plenty of cheese. And you get to do it all in one pot. You simply can’t go wrong here! We all love the convenience of one pot macaroni and cheese, and this may just become your new family favorite recipe. 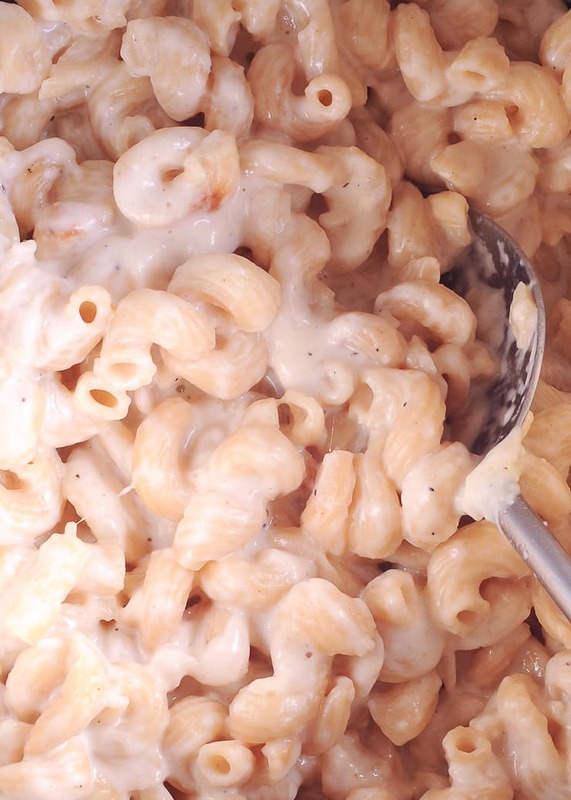 Why make one pot Mac and cheese? Life can get so busy that dedicating time to cooking wholesome meals can be difficult. Can we all just admit that many days cooking is hard? To begin with, using the instant pot saves time, effort, and it’s very convenient. You basically dump everything in one pot and turn it on for 6 minutes. If you ask me this is one of the best, easy ways to use the Instant Pot. 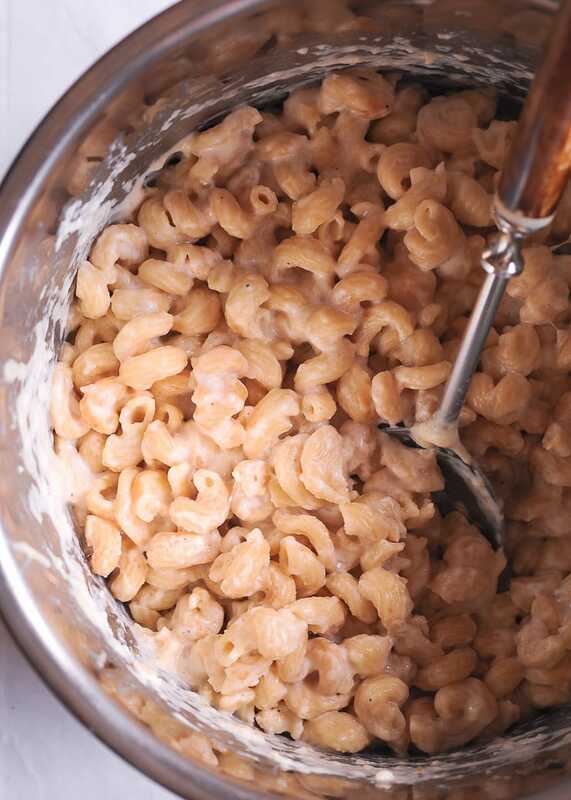 Instant Pot Mac and Cheese delivers truly rich, creamy, and cheesy flavor that we all love about this classic recipe. Convenience! Only one pot to wash at the end! First, you will pressure cook elbow macaroni in chicken stock in the Instant Pot until perfectly tender for 6 minutes. Because the pasta cooks in just enough liquid, there is no need to drain any liquids after it’s done. After quick releasing the pressure, add in the cheeses and milk, and simply stir. If you don’t have milk, you can use evaporated milk or half-and-half instead. Because you will add milk and cheese right inside the pot, they will blend right in and thicken Mac and cheese to the right consistency. Very fast! As a result, you will be able enjoy a rich creamy saucy macaroni and cheese that is easy and flavorful in no time! 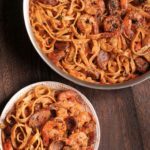 I made this recipe in my 8 quart Instant Pot, and it will definitely work if you have a 6 quart as well. Depending on who will be eating this Instant Pot Mac and Cheese, I have to be creative in choosing the perfect dish to serve it with. I often serve it with sliced Parmesan Crusted Chicken, especially if I’m feeding children. By the way, this is a perfect dish to serve for your children, because it’s so creamy, filling, and rich. The kids also like to eat it with freshly baked Buttermilk bread. Occasionally, I serve Mac and Cheese with fish and pork. But we also enjoyed it with a fresh side salad or a healthy vegetable dish. If I know that I have a busy day in front of me, when I don’t have much time for cooking, having dinner on the table so quickly makes my life so much easier! Everyone has their favorite mac and cheese recipe, and this is mine. 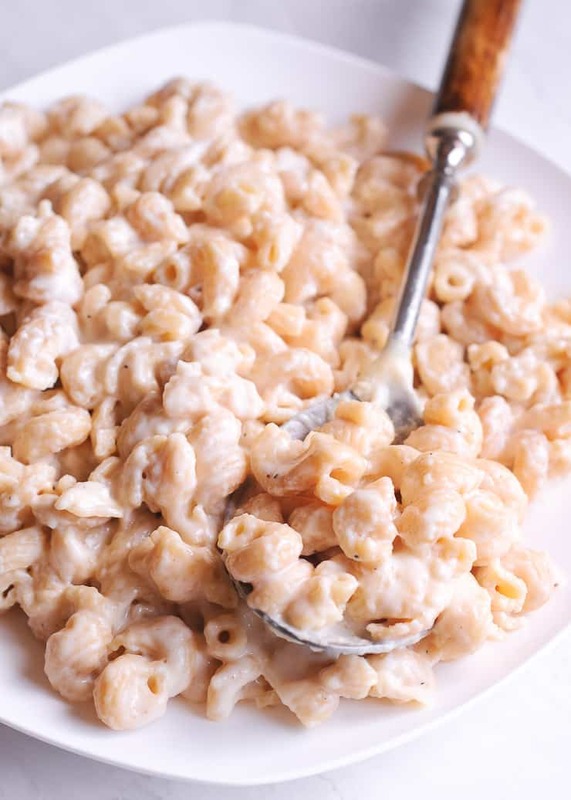 I hope your family will love this easy macaroni and cheese recipe and find the flavor to be absolutely perfect and the sauce – creamy, just like a good mac should be. I’ve made it for potlucks, family gathering, and parties, because it’s so easy to make it quickly in my Instant Pot! We all love the convenience of one pot macaroni and cheese, and this may just become your new family favorite recipe. 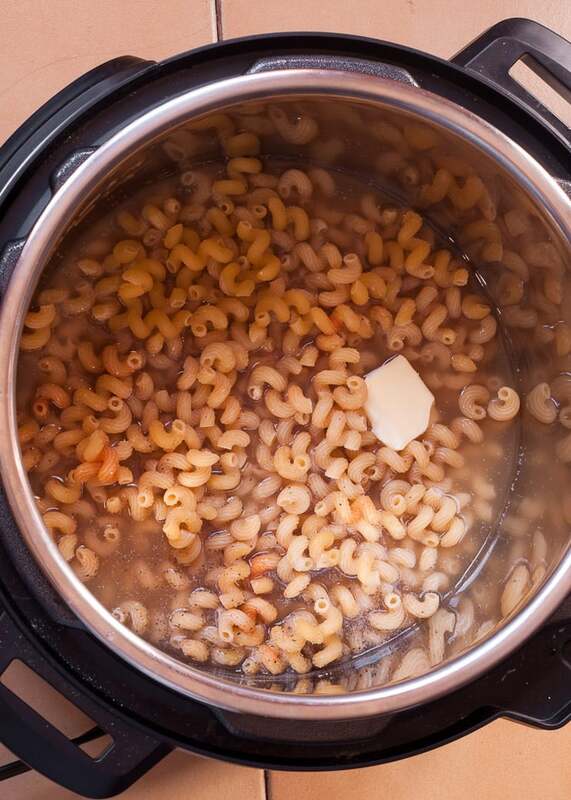 Add dry macaroni noodles, broth, butter, onion powder, garlic powder, salt, and pepper to the instant pot. Set Pressure Cook to High Pressure, and timer for 6 minutes. Do a quick release once completed. Stir in the Cheddar, Mozzarella and Parmesan cheeses. Add the milk slowly until blended. Your pictures show a different pasta. What are you using instead of the elbows? It was durum semolina pasta imported from Italy. I got it in local Home Goods because it resembled elbows, but was made with different type of wheat.